The annual event creates an unparalleled experience with live music, DJs, drag shows, and costume contests amidst terrifying mazes and horrific beasts. 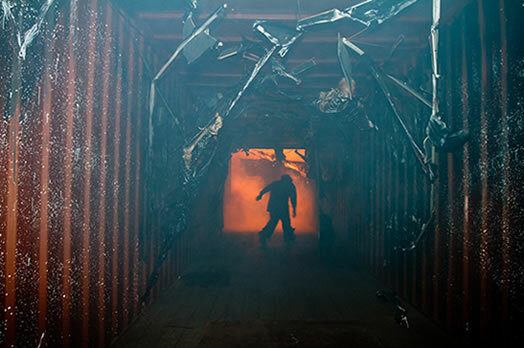 [Long Beach, Calif.] – The Queen Mary’s Dark Harbor is known for horrifying creatures, mazes, and attractions, but the annual event goes beyond the realm of the undead. Live entertainment, radio station takeovers, and special events fill the calendar this Halloween season. Dark Harbor guests are immersed in an interactive experience that offers full bars, extensive food options, VIP packages, DJ performances, live bands, drag shows, Halloween costume contests, and special events that keep fright lovers coming back for more. Screams and radio waves compete for air space beginning Friday, October 11, when Power 106 FM invades the ship’s grounds at Dark Harbor. Southern California’s premiere hip-hop station will take over the event and give listeners a chance to hear the havoc of Dark Harbor on air as DJ J Cruz broadcasts live from inside the Dark Harbor gates. The Power 106 street team joins the fun with giveaways in tow. The antics of The Rhythm Coffin band possess the main stage on Saturday, October 12, dressed to impress at the infamous event. On Sunday, October 13, elaborate costumes fill the outdoor stage for the annual drag show, hosted by Jewels Long Beach and supported by a wicked set from DJ George Figares. Sister act Pixi Kill takes the stage on Thursday, October 17 to ignite Dark Harbor with their alt-electro sounds. The incredible Fartbarf will be performing live on Friday, October 18, followed by a bewitching performance by Post Mortem Grotesque Burlesque at 10:30 p.m. Sounds from the bands Move, Slant, and The Black Lantern fill the remaining Dark Harbor dates with live entertainment. DJ sets by DJ Dennis Owens and DJ Abel are peppered throughout the entire hair-raising month of madness. The Inland Empire’s top pop station slips into the event on Saturday, October 19, when 91.1 KGGI brings along DJs and street teamers to immerse themselves in the depths of Dark Harbor. As the final nights of The Queen Mary’s Dark Harbor draw near, the celebrations only intensify. On Thursday, October 31, Dark Harbor welcomes guests to wear costumes without masks and mingle with over 200 monsters. The bash attracts spirits of all sizes, starting with the Little Monster Halloween Costume Ball that takes place from 4 p.m. to 6 p.m. The children’s costume contest offers $200 in prizes and features magic shows, face painting for $3, and trick-or-treating from the Dark Harbor monsters. Full-grown spirits can participate in The Halloween Costume Ball from 7 p.m. to midnight. The Ball allows participants to mirror the ghouls of Dark Harbor and compete in a costume contest for prizes totaling $1,000. Both costume contests require pre-event registration. DJ Manny Lehman will be providing music for the Halloween event, and Jewels Long Beach returns for the final drag show of the Dark Harbor season. Friday, November 1, and Saturday November 2 welcome two nights of celebration in honor of Día De Los Muertos. DJ Abel provides the beats, and guests are once again allowed to slip into their costumes without masks or props and relish the final nights of The Queen Mary’s Dark Harbor. In addition to spine-tingling general entry, guests can opt for VIP entrance that includes a GA ticket, Fast Fright line priority, drink tickets, and admission into the R.I.P. lounge. The R.I.P. lounge rivals any VIP setting, where guests can enjoy the ghost-eye view of the event, full bar, and made to order taco station. Dark Harbor will be open October 11-13, 17-20, 24-27 and Oct 31 – November 2 from 7 p.m. to midnight with special events and entertainment nightly. For more information, or to purchase tickets online, visit www.queenmary.com/dark-harbor.